Railpictures.ca - MuskokaMoFo Photo: CN 450, CN 5751 South with the help of CN 5765 and CN 5403 in full DB fighting the grade behind them, they’ll hit the bottom of “the bowl” shortly and let off on all the brakes, getting a bit of a boost from the tail end to push them up the hill out of town towards High Falls. | Railpictures.ca – Canadian Railway Photography – photographie ferroviaire Canadienne. 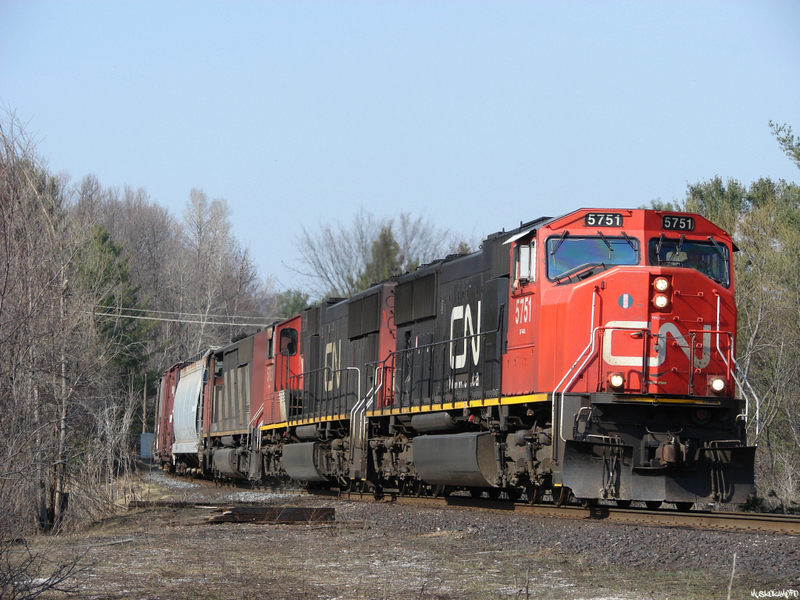 Caption: CN 450, CN 5751 South with the help of CN 5765 and CN 5403 in full DB fighting the grade behind them, they'll hit the bottom of "the bowl" shortly and let off on all the brakes, getting a bit of a boost from the tail end to push them up the hill out of town towards High Falls. Depends on how your train is/handles, there are some grades out of North Bay where engineers get a good feel for how their train will hold with dynamics only. If you have a decent train with a couple of good units, DB early enough is sometimes all you need. Is it just dynos on this hill or do hoggers set a minimum train-line application as a supplement?